Why Scoot Airlines Comes Up Trumps! Call it what you will – budget airline, no-frills carrier, or perhaps even cheap flight. To most travellers, a low-cost carrier is an airline that offers cheaper fares, fewer services and basic amenities. Taking a leap of faith and purchasing a budget airline ticket can go either way – Good or Bad! To be honest, I haven’t experienced a bad flight as such. Being of small build probably does have some serious advantages! Typically, I look at the airlines fleet before purchasing a long-haul flight. The Boeing 787 Dreamliner has dramatically improving the air travel experience. It’s a better way to fly. Scoot Airlines fleet is made up of Airbuses (A320) and wide body Boeing 787 Dreamliners. The airline is a subsidiary of the multi-award-winning Singapore Airlines. The company prides itself on being an airline for the young-at-heart and travellers who are value-seeking. The Singapore based airline commenced operation on 1 November 2011, with just 3 Boeing 777-200 aircrafts. Since 2011, the airline has grown significantly to a fleet of over 40 at the end of 2018 – 16 Dreamliners and 24 Airbus 320s with more on the way. Tigerair officially merged with Scoot Airlines on 25 July 2017 and operates under a single brand, Scoot. Scoot now offers services to over 55 destinations including 20+ across Asia-Pacific. Airline Ratings has awarded Scoot with the Best Low-Cost Airline in the Asia / Pacific Region for the last 4 years. WHY THE PROGRESSIVE TRAVELLER LOVES DREAMLINERS! The Progressive Traveller has flown Scoot Airlines 5 times – 3 times on ScootBiz and twice in Economy. The Comforts of the Dreamliners! 3 days prior to my departure flight, I received a Scoot email offering 2 seat upgrades including the opportunity to bid for an upgrade using the ‘Bid 4 Biz’ link. The lowest bid option available was $150AUD subsequently, I put in a bid for $151AUD. 24 hours prior to my departure, I received another email to say that my bid was successful. YES! Scoot also offers economy passengers a ‘Back-Up’ Plan. 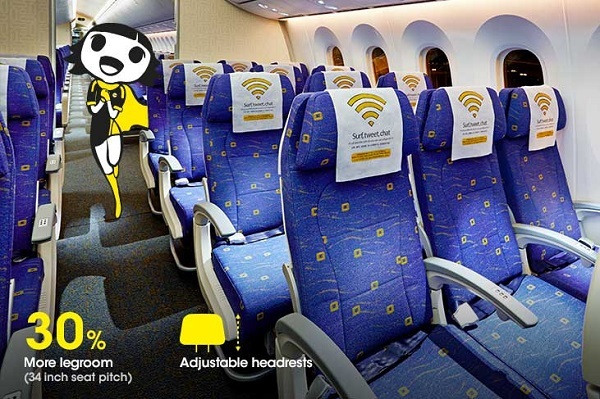 You can request through Scoot ‘MaxYourSpace’, an empty seat next to you for only $50AUD. Both Bid 4 Biz and MaxYourSpace are not guaranteed and subject to availability. You are notified via email if your request is approved or declined. 24 hours prior for Bid 4 Biz and 6-12 hours before departure for MaxYourSpace. Passengers are only charged if their request is approved. If not approved, your original booking remains unaffected. Once the upgrade is accepted, requests cannot be modified, cancelled or refunded. Flying economy with Scoot is value for money and both comfortable and roomy. Passengers can tailor their specific needs by buying only what they need. ‘Standard’ seats in economy on 787 Dreamliners have an average 31” seat pitch and 18” seat width. They are more roomy than other low-cost carriers and comparable to full-service airlines. Passengers can reserve their preferred seat when booking flights – choose a window seat, one by the aisle or one next to their travel companions. For an additional cost there are ‘Super’ seats which have up to 30% more legroom than Standard seats (up to 34” pitch). ‘Stretch’ seats are available on both 787 Dreamliners and Airbus 320s. Stretch seats are the roomiest of all the economy seat options with 50% more legroom than Standard seats (at least 34” pitch) and located up front. Passengers can fly in comfort and be the first few off the plane. ‘Scoot Silence Zone’ is located at the front of all 787 Dreamliners. Besides the exclusive and silent cabin (no kids under 12 allowed here). Passengers can reserve this zone when booking. Every seat comes with an adjustable headrest and where available, passengers can reserve Super and Stretch seats. 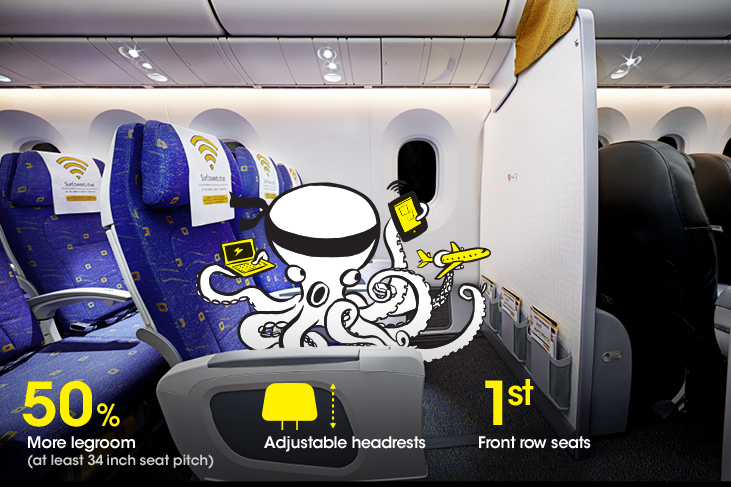 Scoot offers other seat options with ‘MaxYourSpace’. Passengers can purchase up to two empty seats next to them (if available) for as little as $50AUD for each seat. Singapore is a very popular airport ‘hub’ for passengers travelling to other countries. It is a great airport providing quick and easy transport to Singapore city. Singapore is the ‘Progressive Traveller’s preferred stopover destination to break up long-haul flights. Generally, I try to leave the Gold Coast on an early morning flight and stay 1 night in Singapore before flying to Europe on a late evening flight the following day. I never tire of visiting Singapore – there is always new things to see and do, great food with a melting pot of cultures. The Gold Coast has great surf, golden beaches, world-class theme parks, National Parks, fabulous waterways, a diverse restaurant and café scene, nightclubs – you name it and you’ll find it on the wonderful Gold Coast. The Gold Coast hosted the 2018 Commonwealth Games and in preparation there was significant improvements implemented to transport, roads and highways, accommodation, parks and gardens – just about everything. I get a bit tired of hearing that Melbourne is renowned for its world-class coffee culture, music, art and nightlife as I believe every capital city in Australia has these elements too. I do agree that Melbourne is a vibrant city and can understand why it has been voted the world’s most liveable city seven times in a row. Wow, what an acolade! Perth is less than a 5-hour flight away from Singapore. Last year, the ‘Progressive Traveller’ visited Perth and Western Australia for the first time. There are no direct flights to Perth from the Gold Coast. Passengers must leave from Brisbane or other capital cities of Australia. The flight from Brisbane to Perth is around 5-hours hence why most Australian travellers decide on destinations such as Singapore, Indonesia and Thailand for short overseas holidays. Perth is a great city to visit and explore. Most visitors to Perth chose to incorporate visiting the world-class vineyards, cellar doors and restaurants. Sydney is one of the ‘Progressive Traveller’s’ most loved destination in the world. The views and world-class landmarks surrounding ‘Circular Quay’ and the world renowned harbour are the best in the world. Sydney by day and Sydney by night – take on two totally different looks. There is so much on offer, many hidden gems, suburbs worth exploring – there is something spine tingling special about Sydney. To the ‘Progressive Traveller’, Sydney is the most ‘illuminated’ city in the world. Athens has become a popular destination with the introduction of Scoot low-cost fares from the Gold Coast and other Australian capital cities. Passengers are being allured to European cities via Athens, the southernmost gateway to Europe. Scoot Airline’s brand new 787 baby bunk planes named ‘Scootimite’ and ‘Mou-scoot-ka’ recently joined their fleet. Taking a fun spin on beloved gastronomic icons of Australia and Greece, Vegemite and Moussaka – these two planes connect Singapore and Australia to Athens, Greece. Scoot is currently the only airline and low-cost carrier offering direct flight between Southeast Asia and Greece. The average return economy flights from Gold Coast to Athens vary between $550 – $900.